TRMK - Mortal Kombat News - It Has Begun...Again! Mortal Kombat (2011) Arrives! Welcome to the rebirth of a franchise! Mortal Kombat (2011) has arrived and is in stores across the United States, with Europe soon to follow. It has been quite the road for the group once known as the MK Team at the now defunct Midway Games in Chicago. As the series received a reboot, so did the talented creators behind the game. Under a new brightly-lit torch of WB Games, a hardened NetherRealm Studios embarks in a new era of Mortal Kombat. Through bankruptcy and uncertainty, Mortal Kombat fans have stuck with NetherRealm through the darkest of times. Mortal Kombat (2011) is the reward for the fans for all of the years from the dedicated souls at NetherRealm Studios. It is the game that fans have been wanting and craving for years and it is finally here. As you will see with the reviews to come, it has exceeded any and all expectations! Congratulations NetherRealm Studios! Fatality Lives! For those who have their copies already, here's a few places you need to keep in mind. 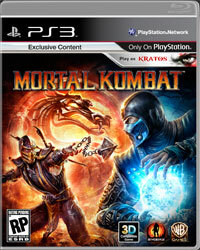 Our Mortal Kombat (2011) Game Guide has been updated and features many of the game's hidden unlockables. The Mortal Kombat Kollector's Edition: Prima Offical Game Guide ($20.21 at Amazon.com) is also a great game kompanion and comes with an awesome set of character reference cards. The Mortal Kombat: Prima Official Game Guide is also available for $11.75 at Amazon.com and comes with a Fatality reference card. For things that are still to be discovered, head into our Mortal Kombat (2011) Forum and share your discoveries with everyone! Also, we are conducting our own Tournament Kompetitions! Check out our TRMK Tournament Kompetitions section for more information. Finally, keep up with our Twitter @TRMK account and "Like" us on Facebook for the latest news and information on Mortal Kombat (2011). Keep it tuned here for some more exciting giveaways in the days to come! Picking mine up over the weekend. This is gonna be fun! Gotta wait til is 10am. CCAANNNTT WWAAIIITTT THANKS NRS!!! This game is freaking amazing! Best mk ever! I live in Europe and have it in my possesion since Saturday. It's everything I hoped it would be and then some! Leaving work early today to go pick up mine! Can't Wait! its at home waiting on me! happy playing guys!